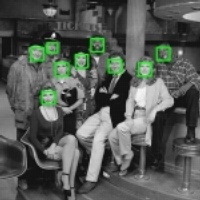 The People Image Analysis (PIA) Consortium develops and distributes technologies that process images and videos to detect, track, and understand people's face, body, and activities. The areas of technology that the PIA Consortium focuses on include detection and tracking of humans, face recognition, facial expression analysis, gait analysis, and activity recognition. The goal of the Consortium is to develop a comprehensive set of imaging and processing tools, systems, or subsystems that work in the real-world environment. The Consortium's full and associate members contribute funds to support researchers at the Robotics Institute of Carnegie Mellon University. In return, members receive the advanced research and development for PIA technologies, as well as the results of related publicly-funded research. Members also receive the benefit of participating in workshops, sending visiting scientists to conduct research at the Robotics Institute, recruiting graduates, and networking. The Member Agreement Form can be downloaded at : PIA Consortium Agreement (PDF). PIA Workshop 2015 was held on December 21, 2015. Visual odometry code released on June 18, 2015. ZFace Tracker code released on March 30, 2015. PIA Workshop 2014 was held on November 26, 2014. A prototype system to stablize the video if the camera is shaking or moving. The output video will be stable as if the camera is virtually not moving at all. A system to provides a group of functions to compute fundamental matrix, projective transformation, affine transformation between two images by robust estimation. A Virtual Background Model to detect motion with a moving camera. A system to enhance image quality under night time or bad whether such as fog, rain, and snow. A Bayesian framework for estimating dense optical flow over time that explicitly estimates a persistent model of background appearance. A system for detecting multiple overlapping objects from a real-time video stream. A master-slave real-time surveillance system designed to detect, track, and acquire biometric imagery of s at distance. An end-to-end prototype system demonstrating a wide range of advanced automated video surveillance and monitoring techniques. 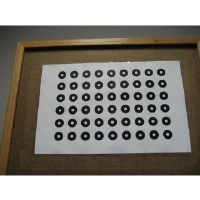 A novel camera calibration method can increases not only an accuracy of intrinsic camera parameters but also an accuracy of stereo camera calibration by utilizing a single framework for square, circle, and ring planar calibration patterns. Given a set of 3D points that we know lie on the surface of an object, we can define many possible surfaces that pass through all of these points. Our goal is to find the particular surface that is closest to the true object surface. Human articulated poses are estimated from a monocular video by combining appearance-based and model-based approaches. Techniques to track Head and Shoulder Line with a Omega-Shape model. A testbed system to evaluate and compare various tracking algorithms. An overview and extension to Lucas-Kanade image alignment algorithm, one of the most widely used techniques in computer vision. Techniques to detect and tracking human Head/Torso/Arms/Legs by probabilistic human body representation. A sensory system designed to provide an electronic agent with physical awareness of the real world. Our event detection method can detect a wide range of actions in video by correlating spatio-temporal shapes to over-segmented videos without background subtraction. Our multi-people tracking method can automatically initialize and terminate paths of people and follow multiple and changeable number of people on cluttered scenes over long time intervals. 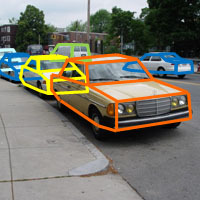 This method can detect cars with occlusions and varying viewpoints from a single still images by using multi-class boosting algorithm. A 2-D and 3-D model-based tracking method can track a human hand rapidly moving and deformed on complicated backgrounds and recover its 3-D pose parameters. The database contains 25 individuals walking on a treadmill in the CMU 3D room. The subjects perform four different walk patterns: slow walk, fast walk, incline walk and walking with a ball. This method can align cars with occlusions and varying viewpoints from a single still images by using correlation filters for landmark detection. This dataset is for research for researches related with surveillance cameras. We collected data with 8 synchronized camera on the path. We present a bottom-up approach for multi-person pose estimation, without using any person detector. Modeling face shapes using PNS. Automatically identify key facial feature points on frontal or side view faces. A method to combine the AAM and the Cylinder Head Tracker so that we can robustly tracking the face on all view angles. A method to recover the full-motion (3 rotations and 3 translations) of the head using a cylindrical model. A neural network-based face detection system to detect faces at any degree of rotation in the image plane. Techniques for building and fitting 2D and 3D models of human faces and heads. 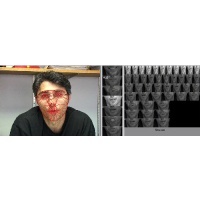 An interdisciplinary research group that covers expertise in facial expression analysis. A face database collection of 41,368 images of 68 people. Each face is under 13 different poses, 43 different illumination conditions, and with 4 different expressions. A feature-based head tracking algorithm can handle occlusions and fast motion of face. A face detection system has an accurate detection rate and real time performance by using an ensemble of weak classifiers. A two-step approach temporally segment facial gestures from video sequences. It can register the rigid and non-rigid motion of the face. A robust facial feature detection algorithm on all pose images with partial occlusions. A feature-based tracking method to recover the full-motion of the head using a cylindrical model. We collected hyperspectral face images covering the spectral range from 450nm to 1100 nm. To date the database contains 54 diverse faces at multiple sessions over a period of about two months. This dataset is for research in automatic facial image analysis and synthesis and for perceptual studies. This dataset is images of participant's faces (who were suffering from shoulder pain) while they were performing a series of active and passive range-of-motion tests. Copyright© PIA Consortium All Rights Reserved.